SDB-005 is an indazole-based synthetic cannabinoid that has been sold online as a designer drug.It is presumed to be an agonist of the CB1 and CB2 cannabinoid receptors. SDB-005 is the indazole core analogue of PB-22 where the 8-hydroxyquinoline has also been replaced with a naphthalene group. The code number SDB-005 was originally used for a different compound, the N-phenyl instead of N-benzyl analogue of SDB-006. 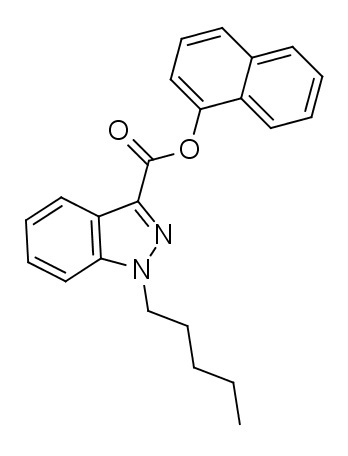 This compound is a potent agonist of the CB1 receptor (Ki = 21 nM) and CB2 receptor (Ki = 140 nM). 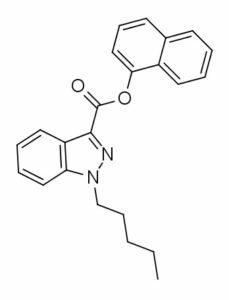 SDB-005 is a new chemical compound that is an indazole analog of PB-22. The chemical formula is C23H22N2O2. Properties that were predicted by ChemAxon included a topology analysis, which showed an atom count of 49, bond count of 52, cyclomatic number of 4, chain atom count of 8, chain bond count of 9, asymmetric atom count of 0, and rotatable bond count of 7. Under geometry, the information provided showed deriding energy of 78.56kcal/mol with a volume of 332.07 Å3, a minimal projection area of 55.84 Å2 and maximum at 105.03 Å2. Chemical and physical properties of compound include a heavy atom count of 17, topological polar surface area of 106, covalently bonded unit count of 1, feature 3D acceptor count of 4, feature 3D donor count of 1, feature 3D ring count of 2, and effective rotor count of 2.6. However SDB-005 was subsequently used as the name for the indazole-3-carboxylate compound mentioned above when it was sold in Europe as a designer drug, and was entered into the EMCDDA synthetic drug database under this name. Consequently, there are now two distinct, yet fairly closely related cannabinoid compounds, which may both be referred to under the code SDB-005.